I‘m excited because this month my white cardboard box will arrive. It’s an early Christmas present sent from my Aunt Diane. Thoughtfully each one of my siblings gets the same parcel and every year the question at hand is, “What are you going to do with yours this year?” Shake the white container and it sounds like a box of marbles, open it, and there lay hundreds of ravishing red, gorgeous round cranberries. It is time to cook up some chutneys, sauces and salads. I might roast, freeze, pulverize or dry them. I’ll add them to sweets, combine them as savories with vegetables and meats or bake them into breads and cookies. It’s so much fun and the possibilities are endless. Uses for cranberries are not the greatest challenge; it’s keeping them corralled in my kitchen since they roll around like sprung pinballs! 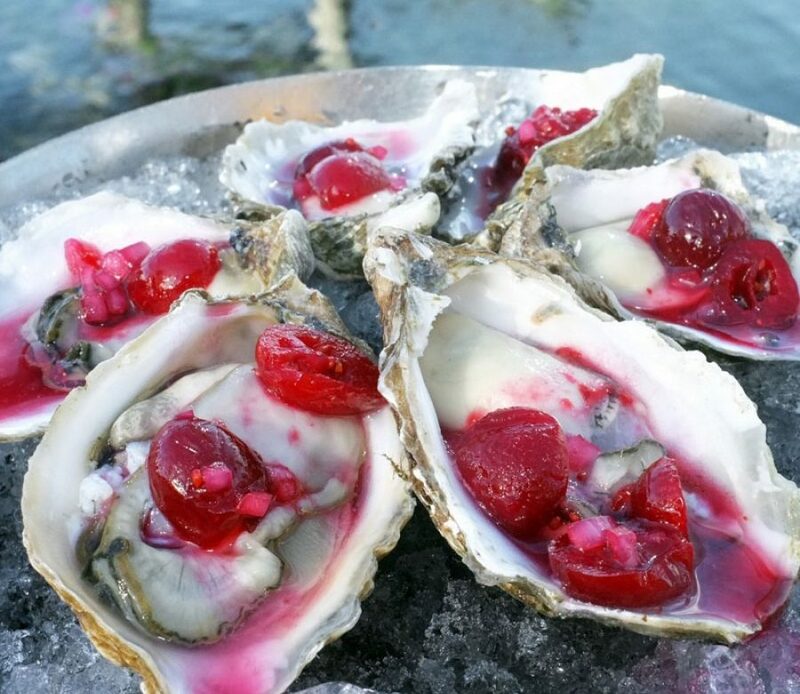 Salty’s chefs invite you to try Kumamoto Oysters finished with yet another wonderful recipe cranberry sunamono November 6 to 12. So come by and “pick cranberries” at Salty’s, no waders necessary! *After writing this blog including a link to the National Geographic video on harvesting cranberries, I discovered a wonderful coincidence: the farm in the video is my first cousins’ in-laws (they were in the video too). They wanted you to know you can also find good information about their farm Glacial Lake Cranberries at cranberry link.com.